First-time visitors to Ethiopia are generally amazed by the stunning natural beauty of a country that is also incredibly rich in culture and history. The striking diversity of landscapes, ancient traditions, and people leave a lasting impression to challenge the misleading stereotype of a land stricken by years of drought and famine. Ethiopia can boast being the only uncolonised country in Africa, having defeated and expelled the Italians after a mere five years of occupation. Ethiopia has emerged into the present day as a fiercely independent and proud country, and one in which Islam and Christianity coexist in relative harmony. Brimming with contrasts and extremes, Ethiopia beckons visitors to explore from the tops of its highlands, where mountains soar over 14,100 feet (4,300 metres), to the depths of the Danakil Depression situated below sea level. Discovering Abyssinian culture and traditions that date back over 3,000 years is incredibly exciting and it is possible to experience ancient Islamic folklore, as well as the fascinating rituals and sacred ceremonies of the Ethiopian Orthodox Church. Ethiopia is described as the Cradle of Humanity, home to the oldest human remains in the world, while at the same time its capital, Addis Ababa, meaning 'New Flower' in Amharic, is home to the more modern problems of urban migration. Addis Ababa can be a difficult place to navigate, but anyone with a desire to learn more about Ethiopian culture would be amiss not to spend more time in this complex city. 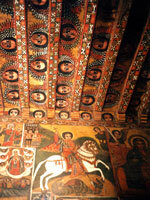 The north of Ethiopia is the most attractive region from an historical and a natural point of view. The Historic Route winds through the medieval wonders of the country, including the ancient cities of Gondar and Axum, as well as the breath-taking Lalibela churches, hewn into rock. The north also boasts the lofty Simien Mountains National Park, encompassing the fourth highest peak on the continent, and providing fantastic hiking opportunities and a variety of wildlife. Bahar Dar, situated on Lake Tana, is popular as a base from which to explore the intriguing monasteries built on the many islands scattered about the lake, as well as the Blue Nile Falls, or 'Great Smoke' falls, which are arguably the most impressive falls in North Africa. The south of Ethiopia, on the other hand, is the heartland of some of the surviving tribal cultures, with villagers living much as they have for centuries. There are fewer awe-inspiring ancient sites but the game reserves and tribal enclaves draw adventurous travellers. Ethiopia was once overlooked as a tourist destination, but the country's unique attractions are taking pride of place in northeast Africa, and today the oldest independent nation on the continent welcomes visitors to experience her long, proud history, and abundance of stunning scenery.